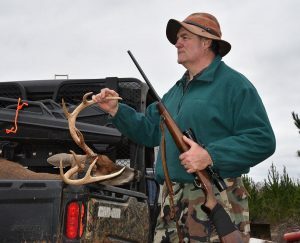 Although the 2018 deer season in central Georgia was not the best we’ve ever had it was not the worst. We harvested deer. Saw more deer and got a lot of work done to make a growing pine forest easier to hunt in. 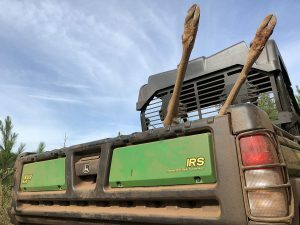 This is my last post from the season since I had to show what one of the most important benefits of having a good utility vehicle with the right accessories is. Besides getting you to and from your deer stand there’s the issue of bringing a large animal out of some of the worst conditions possible. In our case that was a buck in 6 to 10 feet high pricker vine thickets that are covering a hillside and across a creek bed. My bother Paul got the deer down the hill to the creek somehow. I got the Can-Am Defender we had the honor to be using as close to the creek bed as I could. From there we let the WARN winch do the rest. That last 40 yards may not have been possible without it! I had hoped to shoot a lot more video this season but conditions were mostly rainy, windy, muddy and filled with scratches and learning how the pine growth and intense weed growth has changed patterns and paths for the deer. We learned a lot and have some very high hopes for the next season and sure hope we can do it with a Can-Am! A couple of the members of the Crystal Pig Hunt Club are happy this season. My little tiny brother Paul harvested the nicest buck we’ve brought to camp last week. Of course there is a story to this because that’s just part of deer hunting. In this case, Paul saw this 8 pt. buck from his stand about 200 yards or so across a creek and partially uphill in the middle of the nastiest mess of thorn vines and bushes you’ve ever seen. In fact, the whole hillside and a big part of our property is covered with this crap. Someday the pines will get big enough to shade them out. 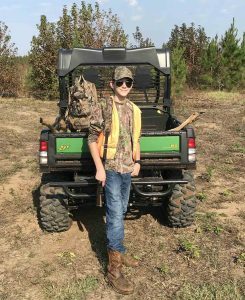 But from the time he went to find the deer with me in his stand guiding him by arm gestures to the time the deer was in the back of the Can-Am Defender we’re test driving it took almost 2 1/2 hours! I think I still have some splinters in my body. The last leg of the journey out of the thickets was over the creek and for that we used the Warn winch on the Can-Am. I don’t know if we would have been successful without it. And I would never get a utility vehicle without one for sure. 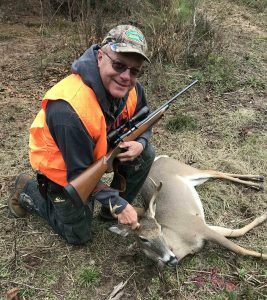 So, we got Paul’s buck back to camp and he had just started cleaning it when I walked back under our pole barn and saw another buck about 120 yards from camp! I had to run back to the Can-Am to get my rifle out of the case that’s mounted on the vehicle. Got back to the barn and he was still there. So, bam, I got a 5 pt. And let’s just say it was not hard getting him back to camp. LOL. All in all that’s what I call a happy deer hunt. We’re going to be back at the Pig after Christmas when my nephews can be there and all of the CPHC team. We’ll continue putting this Can-Am Defender through its paces, especially since there has been so much rain and we’ve got some muddy places to drive through. It’s deer hunting time in Georgia. 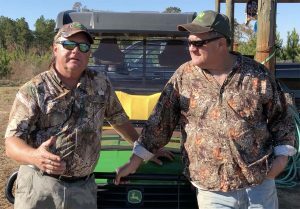 This year the Crystal Pig Hunt Club (CPHC) members are getting to roll in camo style with a machine that is built to handle some pretty rough terrain. 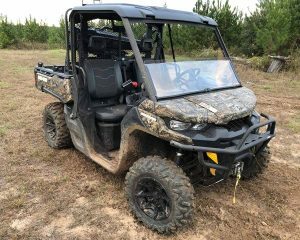 The Can-Am Defender Mossy Oak Hunting Edition is easy to drive and that includes changing to 4-wheel drive when needed. So far we’ve hauled corn to fill feeders, worked on our stands, driven out to our hunt location and back to camp. We also have trail cams set up where we have feeders. 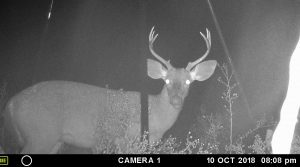 Here’s a night time hello from a nice buck. He’s one of several that have been showing up along with a couple of does. Of course we have feral hogs too. But, so far, they have only showed up in one area of our property. I have only had a couple of days at the CPHC so far but more is coming soon. Looking forward to a great deer season. With deer season behind us the Pig Team goes fishing. 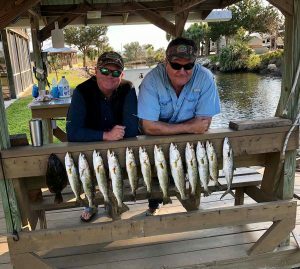 Gary has a nice place on the Gulf of Mexico next to some of the best flats fishing you’ll find. As you can see from the mess in front of Gary here, the reds were biting! 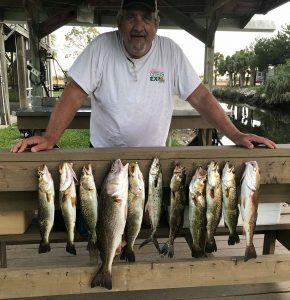 Gary spent a couple days on the water with a friend and they got into some big trout and redfish. You can guess what was on the menu that week. 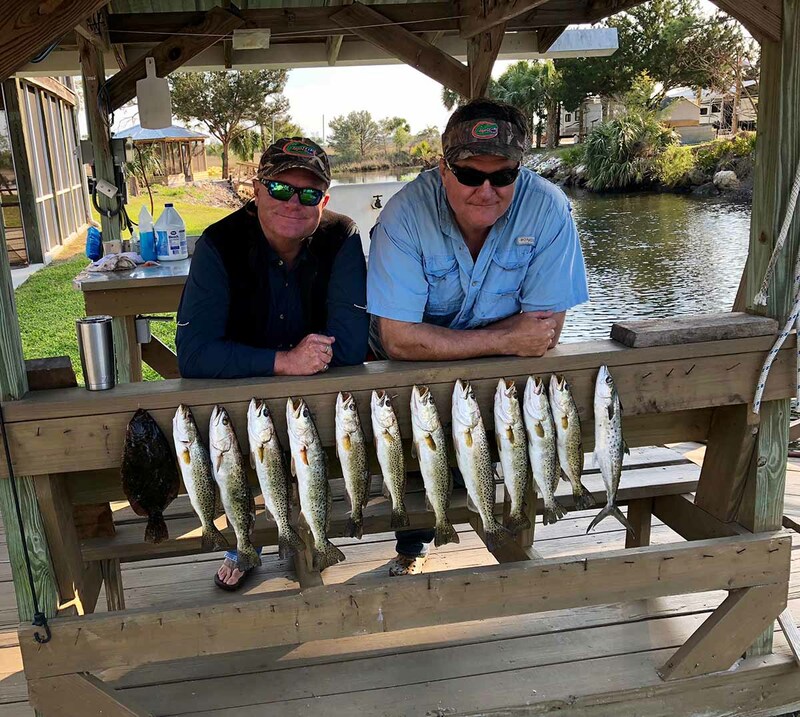 Meanwhile, Paul and I had a chance to visit Gary’s place and fish along with his Cousin Lee. We were a little earlier in the season but still found some trout, a flounder and a lone spanish mackerel. This is my favorite kind of fishing. These fish each have their own characteristics on how to work them once you have them hooked but surprisingly they’ll all hit just about the same bait. Often it’s just a matter of finding them and being there when the bite is on. Hello and welcome from the Crystal Pig Hunt Club (CPHC). It’s time for another episode of hunting with a Can-Am Defender. 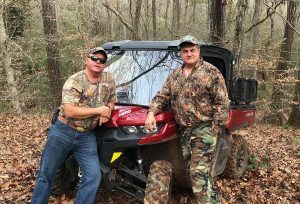 In this episode my brother Paul and I talk about our experience using the utility vehicle in the woods while deer hunting. You’ll hear nothing but praise for this well thought out vehicle which makes it very comfortable to get from camp to the stands and back. Popping in at the end is Paul’s son Joe who has been successfully hunting with us and also helped serve as videographer when called on. I’m a little behind updating here. The CPHC team has had a great start to the season. Here’s my next episode in a series coming to you from the Crystal Pig Hunt Club (CPHC) in Georgia. 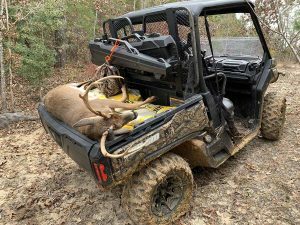 In this episode the focus is going to be on a Can-Am Defender XT which has been provided to us to use and evaluate how well it is suited to some serious deer hunting. CPHC member, Paul Zimmerman, my brother, has been doing most of the driving in this vehicle, although I have done some also. In the video below we chat about our first impressions while riding out of camp for a load of firewood. 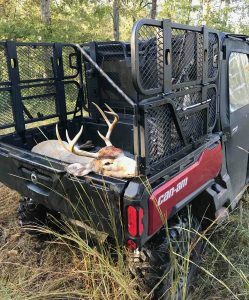 You might see in the bed of the Defender a short swivel seat stand that we strapped into it, making the Defender a mobile deer stand! So, that’s a start. Paul has harvested two deer so far, one of them being the 8pt buck you see in the photo. So, in the points race (we don’t really have one) he’s in the lead. We’re liking the Can-Am but will have more to come. Paul and I spent yesterday checking feeders, stands and the property fire trail that was just re-bulldozed. I’m not actually sure I’d call it a fire trail. We’re going to have to talk to the landowner because that is something that is his responsibility and it it vital for many reasons. We’re hoping that Hurricane Nate does not impact this area. We had some damage from Hurricane Irma. One large tower stand (heavy metal) took a while to find. It was tied down with large metal stakes but was blown off about 75 yards into the pines and weeds. It took a long time to find and today we’re hoping to get it moved back in place. The question is whether it will need some welding to be usable. Another metal tripod stand was blown over and will need welding to make it work. We also had a large barrel feeder blown away with the spreader torn off. The camp itself did not have any damage though and is very comfortable right now. Today we’re going to do what we can with the torn up stands and put out a new feeder and stand in a new location that the fire trail we have has opened up for us. It’s shaping up to be a good hunt starting in two weeks! And BTW. Camp breakfast is the finest kind. 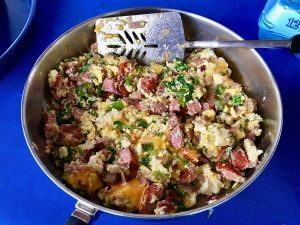 Eggs, sausage, onions, green bell pepper, cilantro, butter, cheese and spices.